The camel's cuter cousin is portrayed on this playful pouch. The more you learn about llamas, the more you want one as a friend: companionable and strong, sure-footed and adorable, they can carry 75-100 pounds with ease. This aqua, yellow, and coral cotton pouch is created for much lighter loads, but still packs a playful punch. Tote toiletries, change, keys, and candy across the Bolivian Altiplano, or just through the produce section. Made in India. The pouch can be used for travel or for everyday use for makeup or jewelry. It's very sturdy and well-made and fun to look at it. This was for someone who is not easy to buy for. She loved it! My daughter will be able to use this in her backpack that she carries everyday to keep it organized with out worry. As many of the other reviews state, the zipper opening is narrow ao it limits the amount of things you can put in it. I use it as a bathroom bag when I travel. I bought this as a gift for a friend and filled it with some beauty products. 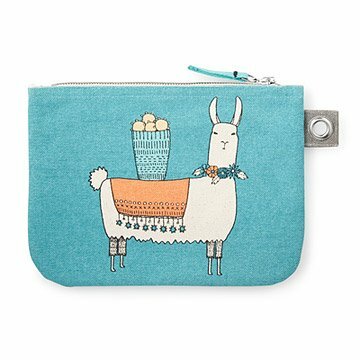 It's both whimsical (colors and llama) and practical (material felt sturdy and it was large enough to hold several cosmetic items)--she loved it. I would not buy this again. The zipper was hard to open. It is a nice size travel bag for jewelry or makeup. Very well made but the zipper is hard to open. This is a cute pouch, large enough for pencils & pens or for a small craft project. I like it cause I can grab it and take it in the car with me and it doesn't take up a lot of room. It would also fit in a tote if I was bringing along other things. I wish the zipper opening was a little longer so that I could get my ipad mini in it. The pouch part is big enough for my ipad mini, but the zipper opening isn't quite long enough. The way the zipper is installed about 1.5 inches don't open at top. Makes it a little cumbersome to find things. It's so cute this doesn't bother me too much.